PICTURES FOR THIS CHAPTER SOON TO COME/ ENJOY STORY FOR NOW. Zephra is holding Nephra's hand and crying over her body that is lying completely still on the ground at the entrance of Zeref's castle. She is feeling and looking for any signs of life from Nephra but there is none. Heroshya remembered that Zephra was going to confront Zeref in 3 days from the time he spoke with her at the hot spring behind the castle and decided that he would travel to Zeref's castle to ensure that all goes well and that Zephra returns to the West safe but he is too late as he flies down. He is shocked at the scene in front of him as he asks Zephra, "What happened to Nephra?" Zephra can barely speak, her voice cracks as she tells him, "She's dead." Heroshya's eyes raise in extreme anguish as he quickly kneels down near Nephra. Zephra continues, "It is all my fault, I should have forced her to remain at home, no... my greed is the cause of this. Nephra is dead because my stupid need for power." Heroshya lifts Nephra's limp upper body and holds her close to him, embracing her tightly, his cheek presses against hers as he shuts his eyes unable to wrap his mind around the fact that Nephra... the sweetest, kindest girl and his very own sister is now dead. He begins to caress her hair, Zephra stops crying for a moment and with a sense of urgency in her voice says, "We gotta get her home to father, Yes, he will use Tensaiga on her and bring her back...C'mon let's go, let's go!!" Heroshya opens his eyes but does not loosen his embrace on Nephra, as he calmly says, "Tensaiga can not save her, by the time we get her back to the West...It will be too late." Zephra rips off her healing necklace and tries to use it, it glows but no life comes to Nephra as Heroshya yells at Zephra, "There is nothing we can do Zephra!!" Zephra suddenly goes into a daze, her body feels stiff and her eyes go blank but the tears still flow as she says in a soft, even and calm tone, "I want him dead." Heroshya looks up at her as she continues, "I'm not leaving here until he is destroyed by my hand. I don't care about empires or power any more, I only want him to perish this very moment." Heroshya is completely on board with this idea, " Then we will kill him, together." He allows Nephra's head to tilt back as he looks at her lovely face that looks so peaceful but lifeless saying, "We won't leave her body here, we will find a safe place to keep her where she will be undisturbed until we can come back to take her to the castle." Zephra knows Zeref's castle and the area around it very well as she responds, "I know a place we can leave her to rest until this is over." They travel to an area very close to Zeref's castle. It is ususally very quiet and secluded there. They lay Nephra down on a pile of leaves there under a tree, placing her hands one on top of the other over her belly. She looks like a sleeping beauty as she lies there all in white and a very tranquil look upon her face. It is difficult for them to leave but finally they do determined to go after Zeref and destroy him, intending to return to Nephra afterwards to break the horrible news to her mother and their father. Zephra and Heroshya walk directly up to the Enterance of Zeref's castle side by side with one goal in mind. The demon gaurds, now being instructed by their master not to allow Zephra or any outsiders into the castle, they attempt to stop them both at the gate. Neither Heroshya nor Zephra bother to speak, request or explain as they simply and ruthlessly strike demon gaurds within their path with out breaking or slowing their stride. "HALT!! NO ONE IS ALLOWED..." The demon gaurd's sentence is cut off by Heroshya quickly slashing it's throat, causing him to fall to the ground as blood sprays out. Another demon grabs Zephra's arm as he instructs, "LEAVE AT ONCE!" Before he knows it a slash blade strikes him in the head at a swift speed slicing the top half of his head completely off. Zephra attacked him so fast that the demon stands there for a moment with only nose and mouth while the upper half of his head is severed. He slowly falls to the ground dying. Heroshya and Zephra continuosly walk directly into the gate as some demons decide not to provoke them as they seem very deadly. Once reaching the castle the demons that gaurd it attempt to fight the duo but suffer the same fate as the other demons that tried to stop them. Zephra knows exactly where to find Zeref, he is either in his quarters or at his throne. They decide to split up and find him in one spot or the other, Heroshya heading towards the throne while Zephra hurries to his sleeping quarters. Heroshya glides quickly around the castle seeking the throne of Zeref, turns out he has a few places that occupy a throne chair so he continues to search, finally finding him at one location inside the castle. He can see Zeref sitting there in a far distance and begins approaching him quickly, saying not a word as he unsheaths his sword. Zeref speaks out, "You got past my gaurds did you? Those worthless fools!" Zeref stands and also unsheaths his sword. Heroshya continues to walk at top speed toward Zeref, no words are spoken as Heroshya raises his sword intent on a vicious blow to Zeref who blocks the blow with his sword. Unlike Suzaku, Heroshya's distress over losing his sister due to this demon does not make it difficult for him to focus on the battle, in fact his anger is so intense it causes his skills to exceed even that of his father. Heroshya jumps backward allowing some space between he and Zeref and weilds his sword in a strong sweeping motion aiming to slice Zeref's midsection in two but Zeref jumps out of the way and attempts to blow a strike of his own at Heroshya, shooting out fast, powerful darts of fire from his eyes. Heroshya creates a demonic shield in an instant, that not only blocks the dart from hitting him but also causes the darts to richochet back to Zeref as he must jump out of the way to avoid his own demonic attack. Heroshya wastes no time in using his swords powers of fierce tornado wind as he points it in Zeref's direction causing such strong current that the lion demon fears he will be sucked up into the tornado. Zeref desperately tries to hold on to his throne chair but it seems useless as objects from around the room are being sucked in, a window crashes causing glass to fly towards the strong wind and Zeref's cloak violently rips off of him. Zeref notices the tornado is beginning to move closer; he can no longer withstand the intensity of it realizing he will soon be sucked in, he transforms into his Lion form giving him more bulk in his weight to handle the suction a bit longer as he flies out the busted window, ejecting himself out of that room away from the tornado. Heroshya stops the wind power, sheaths his sword and flies after Zeref who is now in loin form. Heroshya also changes into his large dog form, they growl, snarl, claw swipe and attempt to bite at each other all while in the sky where the other demons are able to see the entire battle. Meanwhile, while the fight between Heroshya and Zeref was happening at his throne, Zephra had reached Zeref's resting quarters and kicked the door in to find that Zeref was not in there. Not wanting to waste any time, she quickly turns to continue her search and comes face to face with Ryo. Ryo immediately tells Zephra, " Hmf, I told my Master you couldn't be trusted!" Right then Ryo immediately attacks Zephra, creating sharp spears with his stone power. Zephra quickly blocks them creating a type of round shield with her slash blades and dodges to avoid one of the spears coming her way as it passes barely missing her. Zephra groans under her breath, she wants to kill Ryo fast so that she can get back to the main mission. She wastes no time and shoots poision darts from her claws that go flying at Ryo but he is fast and uses demonic power to turn his whole body into stone causing the poison darts from Zephra's claws to richochet off of him. Ryo notices the bit of suprise on Zephra's face as she was unaware that Ryo had this ability. Zephra wonders what she should do next to defeat Ryo. Ryo then says, "Wait until you see what else I can do." He quickly creates a chain made of stone that emits directly from his hand as he manipulates it to wrap around Zephra's neck. He pulls tighter on the chain as she begins to choke and grabs hold of the chain as she gasps for air. Ryo dons a sinister smile as he watches Zephra struggle. Zephra tries to grip the chain attempting to loosen it as she chokes from the tightened chain, she falls to her knees. Zephra can see that the chain has been created from Ryo's stone power and is still attached to his hand so as she has a hold of the chain, she thinks quickly and grips the stone chain tighter, she then uses much of her demonic strength to yank the chain in her direction pulling Ryo foward. Ryo is caught off gaurd when he is yanked and stumbles forward falling on top of Zephra. On instant contact with Ryo, she rams her fist into his chest at the same time releasing her poison claws. The pain from the poison causes Ryo to yell out and grab hold of his chest as the stone chain dissappears, allowing Zephra to be free and able to breathe again. She takes a moment to catch her breath, coughing a bit but quickly gathers herself and gets right back on her feet. Though Zephra's poison claws are strong , they are not enough to defeat Ryo as he also gathers himself from the pain of the poison and shouts at Zephra, "You Are Dead!!" Ryo uses another demonic power as he takes a deep breath in and allows much air to gather in his mouth, when he blows the air out it is no longer breath bit instead now a thick black mist filled with his demonic power, he blows it out in Zephra's direction, she jumps away from it and it hits a candle stick that was near by turning it instantly to stone. As Zephra moves away from it, Ryo guides the black mist with his mouth to follow her but she is skilled dodging it. Ryo's black mist turns the walls of the castle to stone as it hit missing his intended target, Zephra. Ryo takes another deep breath in allowing again for the mist to fly out at Zephra causing her to demonically speed step, jump and flip around it to avoid being turned to stone. Zephra is finding this exhausting as she tries to think of a way out of this mess, Ryo at that very moment mocks Zephra asking, "Aren't you going to use daddy's power to get you out of this?" Zephra replies , "heh, It would be an insult to my father to use his power on a trifling demon. " Ryo responds insulted, "What !! You dare say I'm unworthy. I was being light on you but now I won't hold back." Ryo creates a big stone boulder and with demonic strength violently throws it at her, she speed steps out of the way in the nick of time, as the boulder crashes into the wall causing the wall to become smashed. Zephra does not want to waste anymore time or energy on Ryo, she tries to think of a way to be rid of him. Ryo tells her, "I assure you this time I won't miss." he begins to create another stone boulder larger than the last. As Zephra watches Ryo use demonic power to begin creating a second huge boulder a sudden flash of memory hits her and gives her an idea. Zephra remembers when she was little and how her father taught her to divide her mind to perform two demonic functions at once. Zephra knows that many demons also have difficulty perfoming this technique but her father would not let her give up until she mastered it. She also recalls how she told her father that the technique also absorbs her demonic energy in which her father replied, "It is the same for all demons". Zephra begins to quickly put a plan into motion as Ryo is almost finished creating the boulder and is lifting it over his head. Zephra emits out several slash blades at once aiming them at him while the almost finished boulder is in Ryo's hands. The slash blades rushing towards Ryo surprises him and causes him to panic as he swiftly turns his whole body to stone again to avoid being sliced by the powerful blades. In his panic he unintentionally was able to do what he needed to without thinking about it but when he tries to use demonic power to turn back to normal he finds he can not do it again since his power was being used to create the stone boulder. Unknowledgeable of this technique and how it works he doesn't know how to use demonic power on both functions. Ryo is also unable to move in stone form, he is just as a stone statue and now also slightly drained of demonic energy due to inadvertently using the split power. Zephra chuckles a bit, this is exactly what she hoped would happen as she chuckles, " You are a Fool Ryo, just as I'd always known. " Zephra goes over to the first boulder that Ryo created, she tells Ryo, "The time has come to visit the underworld." She uses her demonic strength to pick up the heavy boulder and throws it at him. The stone on stone collide and Ryo is crushed into pieces. By this time she can hear the commotion and sounds of breaking glass coming from one of his thone area's causing her to realize that Heroshya must have located Zeref. Zephra heads down as quickly as she can to that area but by the time she reaches she sees the broken window and a throne room in ruins but no Heroshya or Zeref. Without delay she runs outside and looks up, she can see Zeref and Heroshya in the air fighting each other with violent force. She placed a hand on her sword while looking up at the fight intent on getting up their to join her brother in battling Zeref but she is redirected when she see's many demon followers of Zeref's attempting to help their master. Zephra wants to kill Zeref more than anything but she decides that for now she will stop the demon servants attempting to assist their ruler, allowing Heroshya to focus only on destroying Zeref. Since they are fighting above ground, in the sky, Zephra doesn't need to worry about many of the demon servants getting up there to join the battle because half of them can not fly. However, Zeref will more than likely guide the fight down to the ground knowing that his servants will attack she and Heroshya out numbering them. Zephra quickly thinks of a way that she can keep the demons contained inside the gates of the castle while at the same time making sure Zeref remains outside the gates, stopping him from getting any assistance from his empire of demons. She comes up with a plan that she thinks may work but she has never tried before. She can see many demons running towards the gate with the intent to get outside the gate, close to where their master is engaging in battle and decides she must act fast. She goes close to the gate but does not exit, instead she unsheathes her sword and positions it against the inner side of the big wall that circles and shields the castle. She transfers demonic energy to her sword causing the black fire to spread and attach with lightning speed as the fire runs along the walls circle shape, She swiftly exits to the outside of the gate before the black fire completes circle run so that she does not get trapped inside of the barrier she just created. Zephra stands back as she watches the demons stop in their tracks, looking in awe at the huge circle of deadly black fire that now surrounds them and the castle as they realize they can not leave the grounds without being destroyed. Zeref can not enter the gates now that the black fire bars his way, too high and out of control for him to fly over it. Zephra has made it so that the battle will not involve any empire or groups of demons out numbering she and Heroshya as they fight. She now tries to think of a way that she can get the both of them to come down to the ground so that she can assist but suddenly she sees a demon woman flying towards her and lands smoothly to her feet as her long, curly light brown hair rests from whipping around in the wind. She is a young and attractive looking female demon; she speaks to Zephra as she shakes her head, "You have made the master very angry, What a disappointment you turned out to be." Zephra wonders, "Who are you? How did you get past my barricade?" The demon responds, "I was never inside the gates my dear. I just happen to be returning from a short days trip. I see all the trouble you have caused my husband. I am wife of Lord Zeref." Zephra says, "Wife? Strange that you would say so. I spent weeks residing in the castle and I never saw any signs of you. Where were you on the nights Zeref requested my company in his resting quarters?" The demon laughs, "Ha,ha... you will not cause me to feel jealousy, that is an emotion felt only by humas and weak half demons such as yourself. Even still, Jealousy seems ridiculous at this point, you see Zeref has many wives....eight in fact." Zephra thinks to herself: Eight? I thought he had four? Akimu was right about Zeref, he is scum.... but who cares anymore, looks like I have bigger problems.... Zephra looks behind the demon and can see four more female demons flying up and landing. The demon continues, "You should have joined us Zephra, you could have been wife number nine...we would have welcomed you in but now you will die." Zephra sees there are five demons intent on fighting her but she does not show fear or intimidation as she asks, 'Huh, only five of you..where are the other three? I'd prefer to kill you all simultaneously." The demon informs, "You need not worry about them, they betrayed our master and is now no longer among the living, you will suffer the same fate." Heroshya and Zeref continue to fight in their true demon forms using their demon powers to battle one another. The roars and moans are so loud coming from the fight that they can be heard through out the area of the castle. Zeref shoots out blazes of fire from his mouth, swipes with his mighty claws and attemps to bite using his sharp fangs. Heroshya uses his acid claws, shoots lasers from his eyes and attempt to bite with his extremely sharp fangs as well. Heroshya uses his finger whips wrapping it around Zerefs throat, pulling the whip tightly attempting to strangle him but Zeref quickly claws the whip away releasing its grip on his neck allowing him to catch his breath once again. Zeref then strikes a demonic force at Heroshya catching him by suprise and causing him to go falling back down to the ground. As he is falling and in pain, he changes from his dog demon form back to his human form and falls to the ground with much force. Zephra is also having problems as she is now in a battle of 5 against one and struggling to keep Zeref's wives from killing her. Zephra is using her sword skillfully as she swings and twirls her sword, bringing it down on her enemy violently, she moves swiftly while using her dog demon hearing and smell to sense when attack is coming from behind or beside her. Zephra artistry with the sword and rapid manuevers helps her to kill 2 of the demons but three of them still remain and they are jumping, flying and speeding around her while attacking. The main demon wife of Zeref changes into a demon form of a very huge serpent and her fangs are the most long and sharp that Zephra has ever seen, the demon strikes Zephra with the fangs puncturing Zephra's shoulder. She grabs hold of the wound as she moans and stumbles a bit from the pain but within minutes her wound begins to slowly heal allowing her to continue with the fight. The demon can not believe that the wound she gave Zephra healed so fast. Another demon wife catches Zephra from behind and swipes her across the back with her claws, this also causes her some pain but she handles it well as she turns striking at the demon who jumps back and avoids the attack. The demons watch as the wound on her back also heals before their eyes. Unbeknownst to the demons, the necklace that Zephra is wearing has the healing powers of the Tensaiga. One demon shouts out, "She is undefeatable. Do you see? Her wounds keep healing." Zephra realizes that they are attacking her much easier, she thinks to herself: They will defeat me if I go on like this, I am working to hard. I've got to save my strength to defeat Zeref. She then yells out, "I don't have time to deal with you wenches!!" at that moment she uses demon powers to spin as fast as a spinning top as she holds her arm up and emits several slash blades at once causing them to fly in circles like a boomerang slicing at the remaining three demons wives in one swoop. Body pieces of the demons and their blood splatter to the ground as Zephra stops spinning and takes a brief moment to catch her breath. After a few moments she runs off to find Heroshya and Zeref, she notices that they are no longer fighting in the sky, she figures they must be on the other side of the castle grounds outside of the entrance gates as she quickly runs in that direction. As the battle between the three continues around the outside of Zeref's castle, Nephra remains lying in the secluded wooded area that her siblings left her in for peace and safety. She remains lying cold and lifeless but her soul is wandering in a place she has never seen before as she looks around at her unfamiliar surroundings, she tries to figure out what is going on. She thinks: Yes, I remember...Zeref struck me with his demonic power. Did I die from that attack? Nephra looks down at her hands and body, she looks and feels normal but she is not in her home land. She slowly walks on the clouds because there is no ground, there are no trees. She can see other demon souls and she asks one of them, "Please, tell me where I am? What is this place?" The demon soul tells her, "You are in the land of the dead, A resting place for the righteous demons." Nephra's suspicion is confirmed as she says to herself out loud, "So I did die this day. I will never see my family again or Suzaku." Nephra feels an overwhelming sadness as the demon looks on and feels empathy for her, then he realizes she is a half dog demon and he says, "You look like.......Please come with me I want to introduce you to someone." She goes with the other demon soul and they walk for quite a distance when they finally come to a huge skeleton, Nephra can not believe the size of it is immense. The demon guides her into the entrance of the huge skeleton and once they enter there is a dog demon standing there; he resembles her father and brother except even more strong and mighty. Nephra realizes that she is looking at her grandfather and she can hardly speak as he slowly approaches her and takes her hand. Her grandfather kisses her cheek and speaks to her with his deep, strong voice, "Nephra, My beautiful grand daughter." She wonders how he knows her name when they have never met but she does not want to ask such a senseless question with so much more important matters running through her mind but yet he seems to know what she is thinking as he tells her, "I have watched you all grow from children to the powerful dog demons you have become today. My son has raised his children well and I am proud that my blood flows through you." Nephra is still astounded, "I can't believe I am speaking to you now, I wish Zephra and Heroshya could meet you also." He responds, "Only the dead can see demon souls, no one of the living will see me." Nephra replies, " I am dead now. I must deal with that." She then embraces him tightly in a hug and he embraces her back, she feels tears fall down her cheek as she says, "Grandfather, I am so pleased to have you here with me. I thought I would wander in this place alone forever without any of my loved ones around me." He then tells her, "My sweet girl, you will not wander here at all. Though this is one of my greatest joys.... having you here with me, I will not keep you here for the sake of my own happiness. I am going to send you back to the world of the living." Nephra's eyes raise as she asks, "But how?" He tells her, "I am able to send you home because your death is premature. You are not suppose to be here now. You have much more to accomplish...even now your brother and sister fight a formidable demon whom can only be defeated with your help. There are so many people who love you Nephra, they will be destroyed forever by your death." He guides Nephra to the border of his world and the world of the living as they continue to talk. They reach the border so quickly that Nephra finds herself not wanting to leave her grandfather; He also finds it difficult to let her go but they both know she must hurry to help her siblings defeat Zeref. She says, "My heart breaks knowing I will not see you again." He assures her, "We will meet again, when your time comes. That will be very many years from now but I will wait for you watching over you from my resting place." He cups her face with his hands and kisses her forehead as he says, "Go and live, the precious gift of life will not be taken from you. I will be with you in spirit." He removes his hands from her face as the brightest light comes between he and Nephra, the light is so intense that Nephra must close her eyes to shield them from it. When she opens her eyes she is back in the forest, lying there where Zephra and Heroshya left her. She sits up and realizes she is back with the world of the living; she is extremely grateful to her grandfather whom bestowed life to her once again. She knows it was not a dream that she held her grandfather's hands, felt his lips upon her cheek and embraced him in a hug. These are lovely memories that will fill her heart and remain with her always but she thinks no one would ever believe her. Nephra quickly gathers herself as she heads to Zeref's castle for she and her siblings to settle the score with Zeref. When Zephra runs to the other side of the castle, she can see Heroshya in the distance; he seems to be wounded and stumbling a bit as Zeref strikes a demonic force at him as a neon green blast quickly and strongly fires out ... but Heroshya swings his acid claws at Zeref slashing him badly just before being struck with the demonic blast. The acid is coarsing through Zerefs wound and he backs down for a moment to recover from this. Heroshya is also lying on his back from the demonic blast and finds that he is extremely weak from the hit. Zephra runs over to Heroshya, kneels down and grabs his hand, "Are you hurt badly?" Heroshya responds, "I don't feel hurt, I feel weak all of a sudden." Zephra knows what Zeref did to Heroshya, "He drained you of your demonic energy. It's a power he uses to help him defeat an enemy. Your demonic energy will slowly return but you have to rest a few moments, I'll continue the fight until you return to normal." Zephra goes to leave but Heroshya grabs her arm, "No, You're not fighing him by yourself." He attempts to rise but is too weak. Zephra tells him, "Heroshya, you have to stay out of this for now, he will attack you hard while you are in this weak state and he will surely kill you." Zephra then says something that Heroshya never thought he'd hear her say, "I've already lost Nephra, I don't want to lose you too." She rises and unsheaths her sword as she goes directly for Zeref, "Get up Zeref, We are about to finish this." He responds, "Yes, You're right, I will finish you after I deal with him." Zeref attempts to strike at Heroshya while he is down and drained of energy but Zephra does not let him near Heroshya. She stands in his way ready to block any blows as she strikes at him with speeding blades causing him to back off, she says, "You will fight only me... right now!" Zeref and Zephra clash blades with each other all the while she is careful to keep him far away from Heroshya allowing him to slowly regain his energy back. Zeref is amazed at how skilled Zephra is with her sword as her body moves with perfection and speed around him while avoiding his attacks. The smooth way she swings her sword as if she has complete control over every single stroke and jab. It took Zeref many years to learn to weild a sword as well as she is now, he cannot help but comment as they fight, "You would have made me an excellent wife..this battle would not have happened had you agreed to marry me...you see this is all your fault." Zephra continues to attack at him, "I decided that I have no desire to be wife number nine to such a loathesome demon as you!!" Zeref responds, "So you met my other wives did you? You would have been different Zephra." Zephra tells him, "Save you're lies, I do not care about anything you have to say. You will die for killing my sister !!" Zeref is jabbed in the side as she finishes her sentence, he moans a bit in pain as blood gushes out. She continues to come at him with her vengeance so he turns back into his lion form and shoots out fire at her but she blocks it. Zephra does not attempt to use her black fire because Zeref has fire of his own, the black fire may actually wound him but it will not kill him. She used it once already to create a barrier around the castle,she will be completely drained of demonic energy if she uses it a second time so she decides she doesn't want to waste her demonic energy on something that will not kill him. Instead she continues to fight him with her sword but she thinks it is all hopeless, he is not dying...she needs Heroshya's help once he recovers. Heroshya is getting some of his energy back but it's not coming back quickly enough, he is able to stand now but his powers seem weak and faded. He attemps to laser a near by tree to test his demonic strength, the lasers come out but the tree is barely damaged. He looks at his claws and attempt to put acid to them but the color indicating acid in his claws blinks in and out. He realizes he still needs a bit more time. Zephra continues to fight trying to come up with a plan for defeating him, she thinks: Should I fight him until he tires and then finish him off or should I pierce his evil heart, perhaps that will lead to his demise, what should I do to end this? As Zephra is thinking this, Zeref catches her off gaurd with a swipe of his sword. She falls to the ground holding her bloody wound as Heroshya runs to her aid, still not fully replenished of his demonic energy. He joins her on the ground by kneeling to her side as he grabs hold of her, they both hear Zeref yell out, "Now I will destroy you both and that will be the end of Sesshomaru's offspring!!!" Zephra and Herosha can not escape in time as Zeref raises both his hands and creates a huge ball full of hot molten lava powerful enough to melt through any shield. It comes flying at top speed towards them. Heroshya still too weak to create a demonic sheild or use any effective demonic powers, decides to at least sheild Zephra with his own body and he does, holding her steady so that she does not get in the way of the flying lava ball; he is ready to take on the complete impact to save her. Zephra yells in fear as she sees that the giant lava ball will cause her brother's demise, "Noooo, Heroshya!!!" His eyes are shut tight as he waits for the strike to hit him but instead he hears a thunderous clash, he and Zephra both look as they see a large thick block of ice and the lava ball have collided with each other. The ice melts the lava ball and the lava melts the ice as the liquids spill and combine together on the ground. Suddenly Nephra appears to everyone's amazement, Zeref yells out, "You? Still alive!!!??" he attempts to swing at her with his sword but Nephra is also extremely skilled as she gives Zeref a challenge in battle. Zephra and Heroshya can not believe that Nephra is alive but they are both so overjoyed to see her alive and well, that they sit there in shock for a moment while Nephra fights Zeref. Heroshya can feel his powers returning and is determined to finish the fight telling Zephra, "We have to work together if we are going to defeat him, just like we did in the tournament...remember when we combined our powers? Now we have Nephra with us again all three swords together will destroy Zeref." Zephra nods her head in agreement as they come up with the master plan. Since they have tested the powers of the three swords together before as their father had instructed, they are already aware of the order that it must be done in, Zephra shouts out to Nephra, "We are going to do it now!!" Nephra knows what Zephra means as she shouts back, "Alright, Let's do it!!" Zephra goes first striking her sword heavy on the ground and adding demonic power to it as the black fire goes flying like a speeding bullet towards Zeref. The black fire takes over his body and he shakes from the pain of it but not enough to kill him as Nephra goes next, Striking her sword to the ground and adding demonic power to it for the second time as it also speeds at him causing him to turn into an ice statue, Heroshya then strikes his sword to the ground as the earth of his sword emits huge, strong stones and rocks to hit Zeref hard as he breaks apart into icy pieces. Heroshya strikes his sword the final time allowing the wind of his sword to sweep their enemy away never to be bothered by him again. Their fight with Zeref was long and challenging but they have won the battle and are now able to claim the East as their own. The demon servants of Zeref are still entrapped in the black fire, some cheer when they see that Zeref is defeated and some of them do not. Zephra tells Heroshya, "Go on, Claim this land as your new kingdom, You are their ruler now." Heroshya asks Zephra, "I thought you wanted to rule? You can claim the land." Zephra tells him, "When I thought Nephra was dead and when I thought you would die, It was then that I realized, my family means more to me than power and position in a kingdom. All of a sudden, being ruler over a land just didn't matter to me anymore. I have all I need and want already...My family and friends in the Western lands and I couldn't be happier." Nephra uses the water of her sword to diminish the black fire as Heroshya makes the announcement to the demon servants, " Your Master, Zeref has been defeated by the dog demons of the West! We now rule the Eastern and Western lands, I am your new Master of the East. If there is anyone who is against this and wishes to challenge me, do so now!!!" No one comes forward and Heroshya now rules the East. Most of the demon servants are astonished that 3 sibling demons were able to take over a kingdom without any help when most rulers require the assitance of their entire empire to fight and win a war for possession of land. They humbly submit to Heroshya as their new ruler and respect him and his fighting abilities. Zephra hugs Nephra tightly and says, "I'm so happy you're safe. I thought you were out of my life forever." Heroshya asks her, "You were dead Nephra, I felt for your heart beat and your breathing...there was none. What happened?" Nephra says, "I'll tell you but you won't believe me. I saw our grandfather when I was in the land of the dead." They look with surprise as she finishes her story, " He sent me back here to live on...he said I would accomplish great things. Marry and have strong powerful children." This thought reminds her as she asks, "Wait, where is Suzaku??" Zephra tells her, "Oh That's right, I was so happy to see you alive, I'd forgotten. He was hurt by Zeref Nephra...c'mon, I'll help you find him. I think I know where he may be." 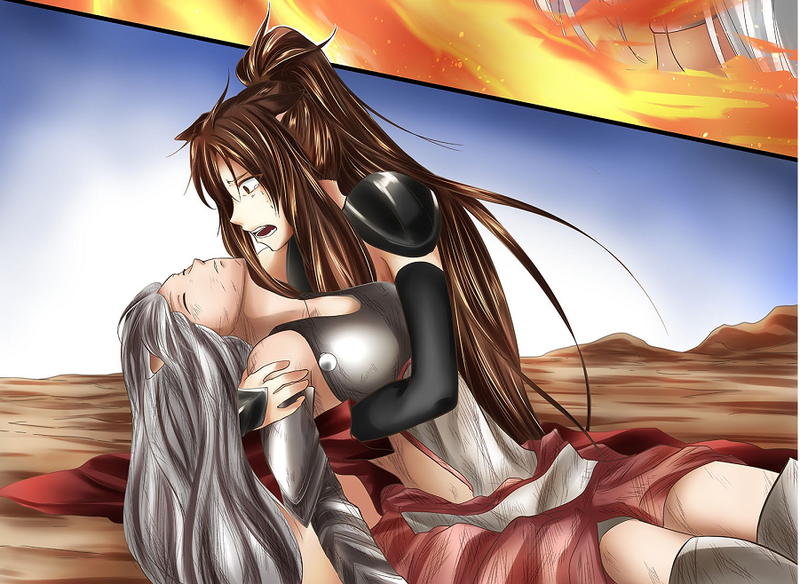 Zephra leads Nephra to a spot where she believes that Suzaku may have gone to rest from his wounds and she is correct as they both see him lying there with his eyes closed and blood seems to be everywhere. Zephra stands back as Nephra runs to his aid and she calls out softly to him, "Suzaku...Please wake up." Suzaku slowly opens his eyes and thinks he is dreaming when he sees Nephra's lovely face above him. He says, "You are alive??" He places his hand on her cheek and she places her hand over his as he continues, "Or am I dead and in the spirit realm with you?" She smiles at his adorable remark. Suzaku looks behind Nephra and can see Zephra standing near by watching and says, "Oh No...Maybe I'm in the Underworld!" Zephra responds, "Hmf, So you're well enough to make jokes are you? I should have left you here a few more days." Nephra remarks as she begins to remove her healing necklace, "Would you two at least attempt to get along with one another?" She places the healing necklace on him and it glows as the wounds slowly begin to heal from Suzaku and his strength returns. He feels as good as new, no pain from his wound and is able to walk once again. They all head back to the Western lands of Lord Sesshomaru, Suzaku is not sad to be leaving the East. Heroshya has a new empire on his hands that he must now rule and keep order of, He knows he will not be able to spend as much time in the West as he used to. He explains to his father upon return that they have defeated his enemy Zeref and he is now the new ruler of the Eastern lands. He adds, "Father, I would like you to grant permission for me to pass your empire over to Nephra and Zephra." Sesshomaru is a bit surprised that Heroshya did not chose to add the Western empire to the Eastern giving him rein over half of Japan. Sesshomaru asks, "Son, Are you sure this is truly what you desire, for your sisters to rule this land when I pass it on?" Heroshya explains, "Yes I believe that together, my sisters ruling of this land would be the best decision for your empire to remain strong and prosperous. Nephra, has the kindness of heart to ensure that the demons and humans who remain here in this land are happy serving under your memory and Zephra has the heart of a warrior, she will do well to keep this land protected. She is excellent at strategizing, she will lead many great battles with this empire. besides, My land in the East will always be one with the West. We will work together and be connected." Sesshomaru finds this idea acceptable and agrees, "Very well, Nephra and Zephra will rule the West. I shall pass the empire on to them when my time here has come to its end." 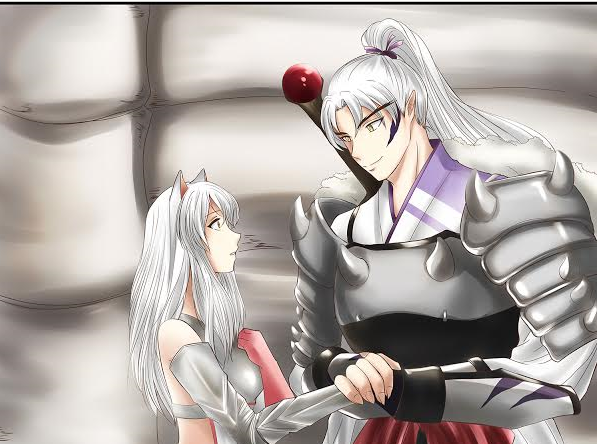 Rin is standing near her husband as he speaks on the matter of the empire being passed on, she is proud that her daughters will be the ones to take on the task of ruling the lands when she and Sesshomaru retire their last years together in their beautiful private forest. Zephra is pleased that Heroshya decided to pass the empire down to them and she graciously accepts to care for it but the passion to become ruler that she once possessed no longer exsists as she has come to realize her most important assets have been in her life from the beginning,... family and friends. The next morning Suzaku is at the castle and he feels nervous at the very thought of approaching "The Great Lord Sesshomaru" regarding his daughter. Nephra notices that Suzaku fidgets as one of the demon servants goes to announce Suzaku and get Lord Sesshomaru's permission for them to speak of an important matter. Nephra tries to calm Suzaku, "How could he turn you down? You are a strong, powerful demon. I think he would be happy to see us married." Suzaku asks, "What about your brother, he will never give his blessing...That means your father will refuse the marriage as well. Nephra, if that happens....we should run away together. We'll come back when all is forgotten." Nephra laughs, "You are being hasty Suzaku, we have nothing but time." Just then the demon servant informs Suzaku, "My lord will see you now." Suzaku takes a deep breath and begins to walk in as Nephra says, "Good luck my love, I'll wait for you here!" Suzaku walks down the long corridor as he approaches Lord Sesshomaru who sits on his thone chair, He looks mighty and intimidating to Suzaku. Rin who he knows is Nephra's human mother, stands to her husbands left wearing a stunning gown and Heroshya stands to his right looking as a strong prince demon would with his swords tucked in his sash. 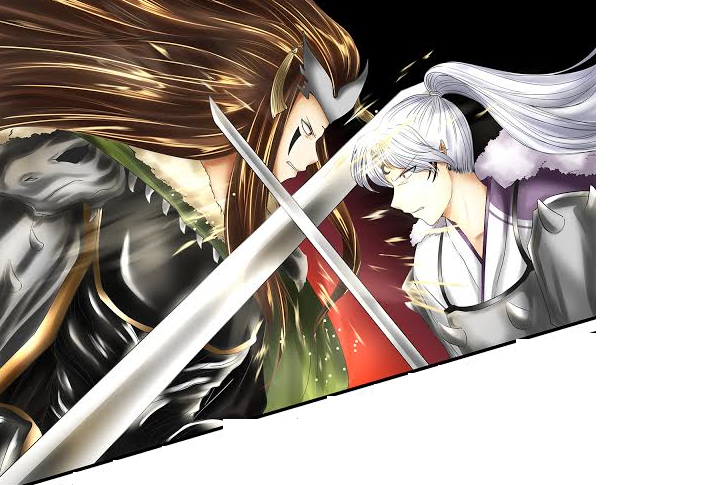 Suzaku approaches Sesshomaru and kneels immediately, "Lord Sesshomaru, I thank you for this moment of your time." Sesshomaru replies, "Stand and speak your request." Suzaku asks, "I wish to ask for your daughter's hand in marriage." Sesshomaru asks him, "Which of my daughters do you wish to take ? I have more than one." Suzaku is so nervous he forgot to mention who as he continues, "I apologize for my vague request milord. I wish to have your daughter Nephra as my wife. I ask that you give your blessing." Sesshomaru responds, "Hmm...you wish to marry my Nephra do you? I do not know you, Your name is not known in these lands. Do you expect me to hand over my precious daughter to some unknown demon?" Suzaku explains, "I am not of your land Lord Sesshomaru, I am of the East. I once served Zeref, your enemy but my love for your daughter has caused me to abandon my master and leave his empire. I am not evil as he, I did his biddings only as a show of gratitude for him saving my life as a young demon but the truth is that I became free when Nephra entered my life and I finally had the will to leave Zeref's control." Sesshomaru responds, "I see." As Heroshya stated, Sesshomaru first requires his son's opinion before giving his blessing, "Heroshya, what do you know of this demon." Suzaku fears the answer, He and Heroshya have not gotten along ever. Heroshya tells his father, "Suzaku has been one of my enemies for many years, we have fought many battles he and I. The truth father, He has nothing but good intentions towards Nephra...he loves her and even risked his safety for her many times. It is a good match...He is strong, trust worthy and intellegent. Suzaku would make Nephra a fine husband as well as a good addition to your empire. I would like to give my blessing under one condition...." He directs his focus at Suzaku as he continues, "You will not take Nephra away from the Western lands." Suzaku responds, "Heroshya, Now that Zeref is dead, I have no reason to leave here...I only suggested that once before to keep her safe from him." Sesshomaru responds, "Well, It seems my son speaks highly of you, Suzaku." Suzaku is in shock at the answer Heroshya just gave as he nods to Lord Sesshomaru. Sesshomaru asks his wife, "Rin, do you have any objections?" Rin replies, "I trust Heroshya's assessment and this demon shows bravery in approaching you as the first suitor to ask for one of our daughters. I would like to bless the union My lord." Sesshomaru gives his answer, "Very well, I give you blessings to marry my daughter Nephra." Nephra waits alone outside also a little nervous of what the outcome is, she does not know what Heroshya is going to say but the last time they spoke he still had no intention of giving his blessing. She is nervous as she stares out at the beautiful blue sky thinking as Zephra and Akimu walk up to her. Zephra assures her, "You know, what ever the outcome...Father and Heroshya will only be doing what they think is best for you." Akimu adds in, "Right, they love you. They have to make sure Suzaku will be a good husband for you." Nephra responds, "I know they love me but Suzaku does too. He will be crushed if they refuse him." Akimu asks, "What will you do if they refuse to bless the marriage, will you run away with him?" Zephra makes a face at Akimu and gives him a poke with her elbow as to say... that's a personal question. Akimu grabs his arm from the sharp pain as Nephra responds to his question, "No, we will not run away. We will just continue to see each other and Suzaku will continue to ask father every year until he says yes." Zephra responds, "I don't think that will be necessary" she motions at Suzaku who seems to be very happy as he comes towards Nephra, embracing her tightly in a hug and lifting her off the ground as he tells her, "He said yes!!" Nephra is overjoyed to hear so as she holds him tighter. Suzaku places her down, takes her lovely face in the palms of his hands and kisses her softly and passionately not caring who is around. Zephra smiles at their happiness and love for each other as Akimu places his arm around her shoulders and she places her arm around his waist. They walk off, leaving Nephra and Suzaku alone. All is well as the future looks bright for everyone, Heroshya is now the ruler of the Eastern Empire at the youngest age any demon has aquired an empire before. Nephra is engaged to marry Suzaku who now serves Sesshomaru as one of his top demon advisors and is right hand man to Heroshya. Zephra enjoys life more now without the constant missions to prove her superiority and fighting skills in an attempt to be a powerful female demon. She knows she is powerful and she will rule her father's empire well when the time comes. 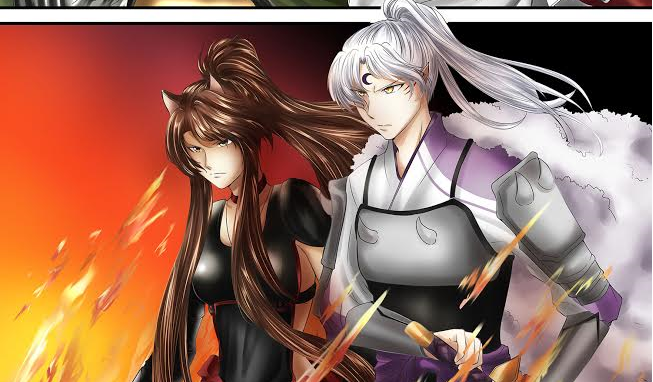 Rin and Sesshomaru remain as Ruler and queen of the empire, they have many years before it will need to be passed on but Sesshomaru has his demons work on the castle that he and his wife will remain in for their last hundred years. Rin loves her Lord and master more and more each day. She often thinks of when she was a little girl traveling with her Lord Sesshomaru.... wishing on stars, hoping and praying to be with him forever. She lies next to him in bed and thinks often to herself: Now I know wishes do come true and my prayers have been answered. She moves in closer to him, lying on his chest as he holds her tight in his arms; he will do that every night for the rest of their lives. PLEASE TAKE A MOMENT TO FILL OUT THE SHORT 5 QUESTION SURVEY. FEEDBACK IS STRONGLY NEEDED AND GREATLY APPRECIATED NO MATTER IF IT IS POSITIVE OR NEGATIVE. CLICK THE "SURVEY" LINK BELOW. THANK YOU FOR READING SESSHOMARU'S EMPIRE FAN FICTION. PLEASE TAKE A MOMENT TO COMPLETE THE 5 QUESTION SURVEY. FEEDBACK IS NEEDED AND APPRECIATED. PLEASE GIVE YOUR HONEST OPINION OF THE STORY.